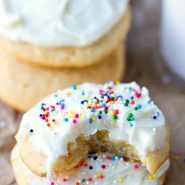 Soft sour cream sugar cookies are so easy to make - no rolling or chilling necessary. Mix in vanilla extract, sour cream, and milk until combined. Batter may look curdled at this point. To make the frosting, beat together butter, powdered sugar, 2 tablespoons milk, vanilla, and salt. Make sure that the butter is at cool room temperature, not room temperature or melting. The butter should dent a little if poked but shouldn't be warm. If the butter is too warm, the cookies won't hold their shape and will end up flat.